There are various turf and tile selections for landscape, playground systems, sports solutions, and putting greens. For use in light to moderate traffic areas. 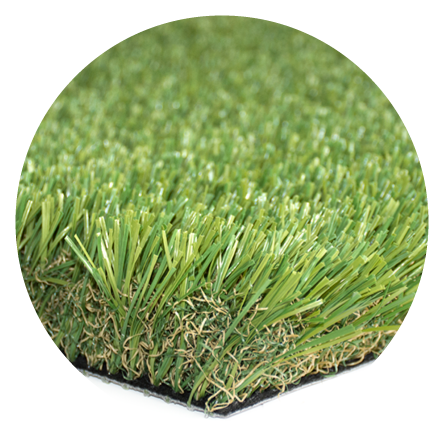 This premium turf gives all the strength expected in an 50 oz product but with extra softness and comfort. Specially designed to keep surface temperatures low. Great for landscaping applications and playgrounds. For use in custom-designed putting greens. This premium turf is designed to give true ball roll and bounce reaction. Infill is required to control stint speed and ball bounce/roll. Specially designed for our Canadian climate. Lots of fun and great for training. For use in light to moderate traffic areas. This economy-priced turf offers great value and flexibility to meet everyone's budget. Designed to truly replicate grass. With a 1.4 blade height, this light weight turf is designed for easy portability. Uniquely formulated polyurethane coated backing provides greater seam strength and durability. Great for landscaping applications, portability and temporary applications. For use in moderate to high traffic areas. 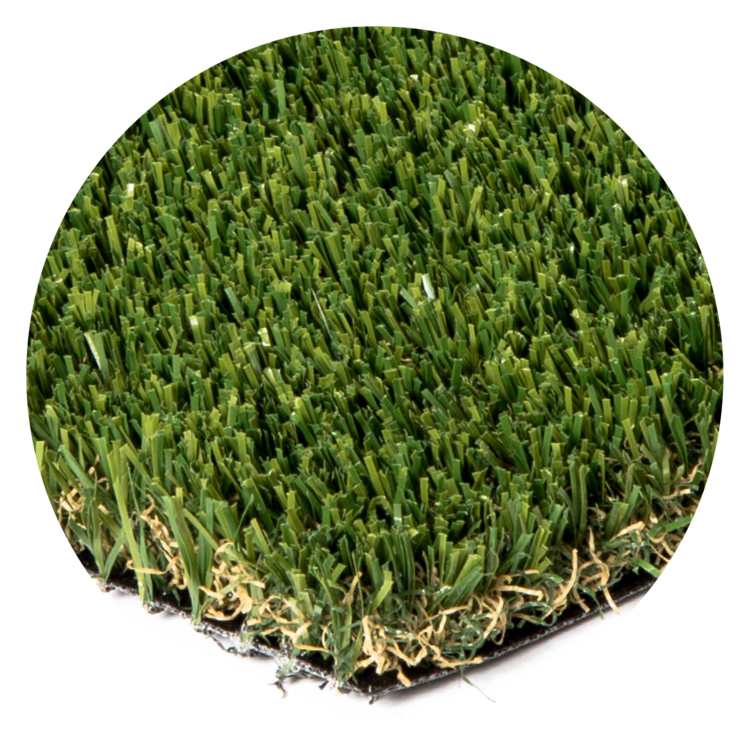 This premium turf gives all the strength expected in an 80 oz product but with extra softness and comfort. Specially designed to keep surface temperatures low. Great for landscaping applications and playgrounds. For use in moderate to high traffic areas. This commercial grade product is designed for pool areas and where product is subject to road salts. Specially formulated and industry-first polyurethane backing. Great for landscaping applications and playgrounds. For use in moderate to high traffic areas. This commercial grade product is designed for longevity. Specially formulated to allow for high drainage rates. Great for landscaping applications, putting green fringe and dog run/agility training areas. For use in moderate to heavy traffic areas. Designed to truly replicate grass. â€œSâ€� shape 3D yarn is specially formulated to reduce heat retention. Designed specifically for landscape application with a soft touch feel. Tannerâ€™s Turf is dedicated to bringing the worlds top products to the synthetic turf market. Our 3D S shaped Durablade Sport turf is a class above the rest. This S shaped yarn gives great durability and rebound for consistent play in our North American climate. Tannerâ€™s Turf tailors the turf to the application and its everyday use. We treat every installation like a fine suite of armour that is ready for battle on the pitch. Pile Height: 1" to 2.5"
1â€³ to 2.5" height for optimum performance. Uniquely formulated Urethane Coating to create strong tuft bond. Playing sports is a combination of being versatile and strong. Tannerâ€™s Turf has a sport turf that reflects the same principles. Versablade sport is a unique V shaped yarn that is strong and resilient to heavy traffic. Playground tiles are available in three top finishesâ€”our â€œBasic Seriesâ€� of black or pigment colours and our â€œEPDM Seriesâ€� of custom colour EPDM granules and are available in a variety of thicknesses to match the fall heights of most play equipment and events. WHY USE TANNER'S TURF PLAYGROUND TILES? be available in a variety of thicknesses to match the fall heights of most play equipment and events. Safe & Healthy Fun for Children!